A product key (also called a license) allows you to operate RTW and RTSHARE either permanently or for a set period of time. FLEXlm License Server For those wishing to run their own license server. By default, upon installation of RTW and RTSHARE, VSLIC is used. 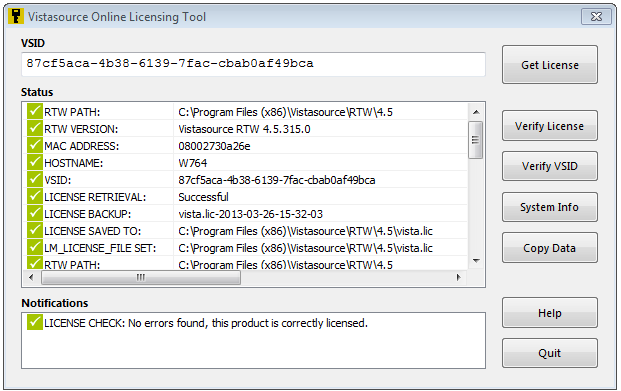 VSLIC is an online product key management tool for RTW and RTSHARE. The Vistasource Online Licensing Tool “vslic” allows easy management of your RTW & RTSHARE licenses by retrieving licenses via an internet connection using a unique identifier, or VSID. A single VSID can be used for multiple machines, simplifying large scale deployment. After downloading and installing RTW for the first time, the application will attempt to obtain a demo license using the VSID “30DAYDEMO”, which will allow you to run RTW for 30 days. This VSID can only be used once for any machine and version of RTW. At the end of the installation, keep the default selection Obtain permanent or evaluation license now. See Installation for more information. In Excel 2007 or 2010, click License Management on the Vistasource ribbon menu. In Excel 2003, click Vistasource → License Management. See Installation for more information. In the RTW application directory which by default is in Windows XP in C:\Program Files\Vistasource\RTW\4.5 and in Windows 7 in C:\Program Files (x86)\Vistasource\RTW\4.5 ). In Windows XP, click on the application named “vslic”. In Windows 7, it is required to run vslic as Administrator. To launch vslic on Windows 7, right-click on the application named “vslic” and select Run as Administrator. The dialog Vistasource Online Licensing Tool opens. A single VSID can cover product keys for multiple machines. The options Verify License and Verify VSID provide information about the licensed features and the scope of the VSID. At the end of the install process, keep the default selection Obtain permanent or evaluation license now. The dialog Vistasource Online Licensing Tool opens. If you install for the first time, the VSID will be set to“30DAYDEMO”. The tool will attempt to generate a demonstration license. If a demonstration license has already been generated for the machine, vslic will error and invite you to contact rtwsales@vistasource.com. If you have obtained a permanent VSID, enter the alphanumeric code. If you are a system administrator and installing multiple instances of the product with automatic license retrievals, see Options further down. Click Get license. The status window displays a list of your license components together with a confirmation that RTW is correctly licensed. A license called “vista.lic” will be installed in the application directory. Click Quit to close the dialog. Restart MS Excel and RTW is ready for use. Click License Management in the Vistasource ribbon menu in MS Excel to open the Vistasource Online Licensing Tool dialog. Enter your alphanumeric VSID, To obtain a permanent VSID, contact rtwsales@vistasource.com. Restart Excel and RTW is ready for use. Click Verify License. The status field displays a list of your licensed RTW features, e.g which RTW engine is licensed. A status message provides information about the state of the license. Click License Management in the Vistasource ribbon menu in Excel to open the Vistasource Online Licensing Tool dialog. Click Verify VSID. The status field displays a list of your licensed RTW features together with how many licenses were purchased, how many are already deployed, and a list of the machines that are currently licensed including install dates and MAC addresses. Click System Info. The status field displays a list of information regarding your system including a check for the RTW version and installed RTW Add-ins. Licenses used under a subscription agreement have an expiration date. The expiration date corresponds to the annual renewal date (plus 1 month grace) of the subscription agreement. To view this expiration date, click Verify VSID in the Online Licensing Tool. The expiration date appears in the status field. Upon successful renewal, click Get license in the Online Licensing Tool to activate the new expiration date. Restart Excel, and your license is valid for the duration according to the renewed leasing terms. A VSID can contain licenses for multiple machines. If your VSID has an associated maintenance plan, uninstalling RTW or RTSHARE will free the license for use on another machine. If these environment variables are set, the Online Licensing Tool will automatically generate the appropriate licenses upon installation. VSLIC is non invasive. The only machine information transmitted online to our license server is the MAC address, Hostname, and Username. We do not sell, trade of otherwise transfer this information to any outside parties. In case problems arise, please check our troubleshooting section. After purchasing the desired number of licenses, the Vistasource licensing department at licensing@vistasource.com will issue valid license keys. In order to create a license key, the licensing department needs the unique MAC Ethernet address of the first Ethernet network interface card of the MS Windows machine, on which you want to install the RTW product. 1. After installing RTW, execute the FLEXlm tool lmtools that is located in the install directory for RTW. Run lmtools to start the program. You will see the dialog box “LMTOOLS by Flexera Software, Inc.”, which contains several tabs. Click on the tab “System Settings”. The MAC Ethernet address is located in the field “Ethernet Address”. Copy the number and forward it to the Vistasource licensing department. In some cases we have found that the the FLEXlm product requires a “C:” drive for its installation. If your machine does not have a “C:” drive, and you are experiencing problems with the license setup, you may need to map the “C:” drive to the drive where you want to install the product. Launch lmtools which is located in the install directory. 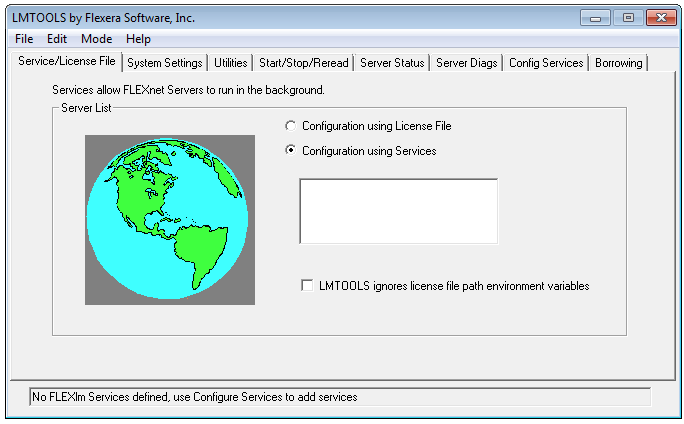 In the “Service/License File” tab choose “Configuration using Services”. In the “Config Services” tab, type “License Server” in the field “Service Name”. Put in the path for lmgrd.exe and the license file. The file lmgrd is in the install directory. Put in the path to your /temp directory for the debug log and name it lmgrd_vistasrc.log. Click on the “Start/Stop/Reread” tab. Your new service should be listed. 2. To set up a license client, choose the option “Specify the License Server”. Another dialog box is displayed where you need to enter the Computer Name of the License Server. 3. Click on Finish to complete the procedure. The RTW status window will now display messages about starting the engine. If you run RTW on a standalone PC or laptop, you need to set up both the license server and license client on that machine. 2. Add the variable LM_LICENSE_FILE and set this to “@hostname” where hostname is the name of the machine running your License Server.